Green turtle (Chelonia mydas) basking on a rock. 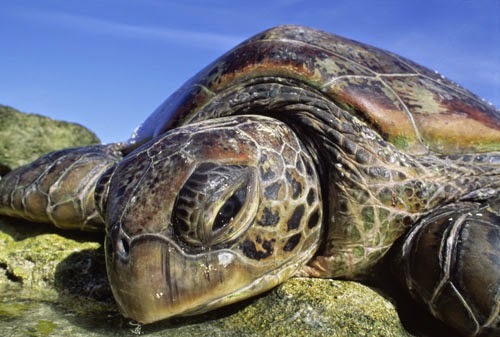 The green turtle lives in warm seas throughout the world. It usually stays close to coasts, feeding on aquatic plants. It can grow up to 1.5 meters in length and weigh up to 200 kilograms. The female green turtle usually returns to the beach where she was born to lay her eggs. The Great Barrier Reef in Australia is the world's largest coral reef system composed of over 900 islands stretching for over 2600 km. 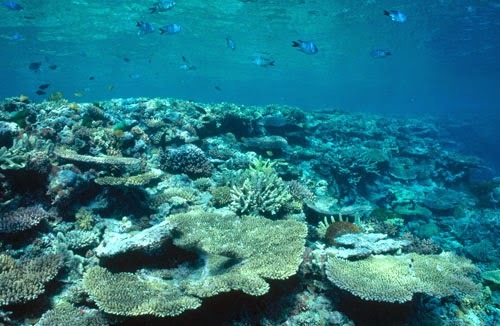 It is located in the Coral Sea, off the coast of Queensland in northeast Australia. 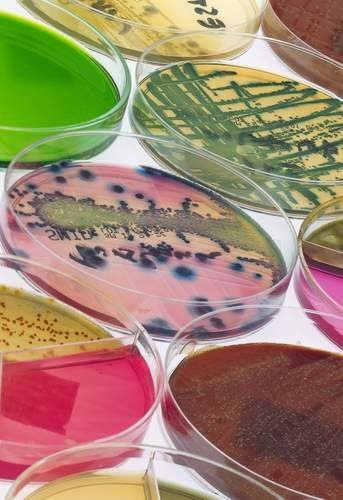 The Quest for "Drugs from Dirt"
Scientists from Rockefeller University recently discovered a new potential antibiotic, known as teixobactin, after screening uncultured bacteria with soil samples containing various nutrients and growth factors. Researchers found that the compound was extremely effective against gram-positive bacteria that are normally antibiotic resistant, such as MRSA or Streptococcus pneumoniae. The quest has begun to collect soil samples from around the world, particularly from unique or unexplored environments like caves and islands, to unearth new compounds produced by the soil's bacteria. The bearded vulture, also known as the lammergeier (Gypaetus barbatus), is found in Europe, India and Africa. This vulture is a specialized, solitary scavenger that feeds almost exclusively on bone. It will patrol a large mountain territory, looking for the cleaned skeleton of a carcass. Small bones are digested whole and larger bones are dropped from a height to break them open and expose the bone marrow. This vulture has strong gastric juices that enable it to digest bone. 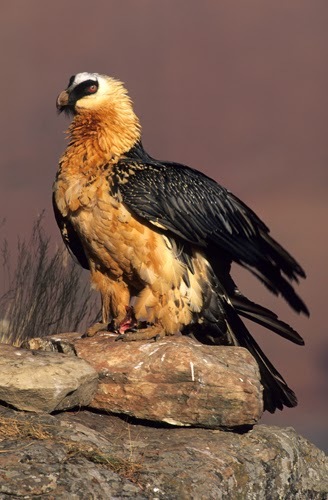 The bearded vulture, found in Europe, Asia, and Africa, is endangered in part of its range. This medium-sized vulture has a wingspan of around 2.5 meters. A study published in the Journal of the Academy of Nutrition and Dietetics found that daily blueberry consumption improved blood pressure and reduced arterial stiffness in postmenopausal women. Researchers performed a double-blind study on a group of women, ages 45-65, with pre- and stage 1-hypertension. Half the participants were given daily servings of freeze-dried blueberry powder, while the other half received a placebo. 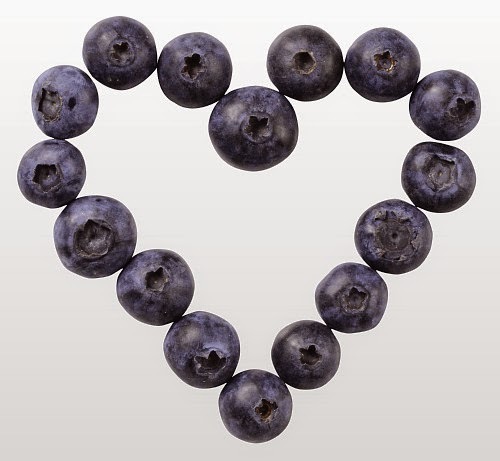 After eight weeks, blueberry eaters showed significant decreases in systolic and diastolic blood pressure as well as an increase in levels of nitric oxide, a chemical known to relax and widen blood vessels. Though the changes in blood pressure were modest compared to traditional blood pressure medications, a growing number of patients are turning to more natural remedies. Blueberries in particular have demonstrated anti-hypertensive and vascular-protective abilities which other fruits have not been able to exhibit. Is "bad luck" responsible for our risk of cancer? 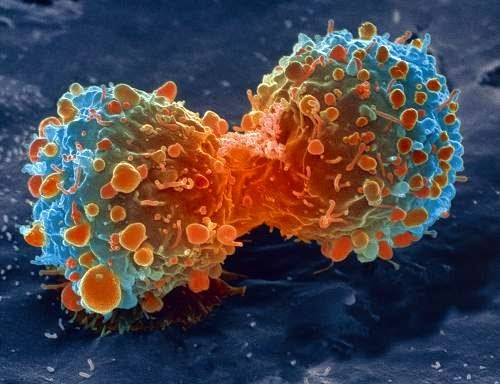 New research suggests that only a third of cancer cases could be attributed to environmental factors, such as drinking and smoking, and that most types of cancer were found to be caused by random mutations. The study, published in the journal Science, sought to explain why some tissue types were more vulnerable to developing cancer compared to others. Cells in the body constantly divide in order to replace old or damaged tissue. Over time, a cell's DNA experiences random mutations which passes on to the newly replicated cell. The result can eventually lead to a mutation which makes the cell cancerous, simply by chance. Tissue cells which constantly regenerate and have a high turnover rate, such as cells in the intestine, were much more susceptible to these random mutations.